Prize Give Away! Fill out #iiwk09 meme “30 Things About My Invisible Illness You May Not Know.” Copy it from our web site here: http://invisibleillnessweek.com/?p=2301 – Share it with others via Facebook “notes”, your blog, etc. THEN… post a COMMENT on our blog http://invisibleillnessweek.com/?p=23 w/ the link to where you posted it and we are going to choose 2 people to receive a prize Sept 5th, 2009. The hardest thing to accept about my new reality has been: Seeing the progression of the breakdown of my body, despite the medications and knowing the older I get, the harder surgeries will be to recover from. Something I never thought I could do with my illness that I did was: go on roller-coasters! We recently went to Disneyland and I just “did it.” And climbing up slides at the park when my son was a toddler and needed help going down. The commercials about my illness: are nothing like reality. They are very deceiving about most illnesses I think. Something I really miss doing since I was diagnosed is: being carefree, being able to walk on sand down to the beach and just walk forever along the coast. It was really hard to have to give up: being creative with my hands like cross-stitching, quilting, etc. If I could have one day of feeling normal again I would: Run. Play with my son, throwing a Frisbee, playing volleyball, running on the beach. My illness has taught me: that life is precious and not to take moments for granted or to take the health of your family for granted. We never know how much time we have with those we love. My favorite motto, scripture, quote that gets me through tough times is: “My comfort in my suffering is this: [God’s] promise preserves my life.” Psalm 119:50 I put it in my emails and when I autograph books. When someone is diagnosed I’d like to tell them: You are not alone in this. It will be hard, but the most important thing is to turn to God, not away from Him. And to find a friend who understands and will listen to you when you need to talk. Something that has surprised me about living with an illness is: The amazing people you meet who have so much joy and strength in the most difficult of circumstances. The nicest thing someone did for me when I wasn’t feeling well was: Just drop by for 5 minutes with a latte or dinner. I’m involved with Invisible Illness Week because: I want people to know they are not alone in their illness journey and that there is hope and joy despite the pain. The fact that you read this list makes me feel: thankful that you cared enough to be informed about illness, because with 1 in 2 people living with an illness, there are many others you know who can use your encouragement and support. Thank you! Is Fibromyalgia a Spectrum of Conditions? As someone who lives with fibromyalgia, it is my secondary illness. This means I was diagnosed with rheumatoid arthritis a few years before fibromyalgia and for me, if my RA is under “control”, the FM isn’t as bad. If my RA is flaring like mad, my whole body aches and a good portion of it is the fibromyaglia. Last winter when I had a bad cough for a few weeks it was the fibromyalgia that was the worst part. In the midst of a deep RA flare, the cough tighened my chest and abdominal muscles and the fibromyalgia made each breath excruciating. Dr. Pellegrino has seen more than 20,000 FM patients in his practice at the Ohio Rehab Center, but perhaps his greatest credential is that he has been a fibromyalgia patient himself since childhood. He explains that there are “Eight Subsets of the Fibromyalgia Spectrum” and what they are. One is actually “Subset 8: Secondary Fibromyalgia Reactive to Disease” which is what one alternative medicine doctor told me once and I’ve never heard said by another doctor since. Wow! Validation. What a concept! Today I’m convinced Fibromyalgia is indeed a “broader” condition with various subsets. I believe this information is helpful in explaining why everyone’s symptoms are different even though they all have Fibromyalgia. This chapter addresses how the Fibromyalgia spectrum is part of the big picture in understanding Fibromyalgia. Medication Commercials – Are They Out of Hand? We’ve all watched them, and most of us with a chronic illness have had a laugh or even a shout out to the TV. I’ve shared my irritation in the past that a person with rheumatoid arthritis (my illness) can be shown in a commercial from being practically bed-ridden to playing tennis and swinging the racquet over her head in what appears to be just days if not hours. Defenders of the direct-to-consumer drug advertising say this is a way to educate consumers and let them know of medical advances. But some critics say the ads do great harm, and reflect a pharmaceutical industry that has run amok. This article/opinion piece from the New York Times has a debate on this issue with some key people. If you are interested in what the future of drug commercials could be, it’s an interesting piece to read. I Don’t Feel Lucky That My Illness is Invisible, But Am I? Oftentimes we only see the negative side of living with an illness that invisible to most people. But as time progresses, so does my own illness, rheumatoid arthritis. I can now see that there are advantages to having an illness that can be hidden or revealed, based on one’s own desires or certain circumstances. I rarely see the changes in my own body, such as my hands or feet deformities, unless I see a reflection in the mirror, for example when I am trying to clothes in a dressing room at a store. I’ve heard children ask their mom, “What is wrong with her feet?” as they’ve looked under the divider from a nearby dressing room. I can’t help but wonder how people don’t realize I have some sort of illness when they see my hands and fingers. Those of us with invisible illnesses were likely yelling at the television because we too have heard, “But you don’t look sick.” But it was true. There were days when she did look like the blond bombshell we all remember from the posters. But there were many other days when she looked like someone fighting for her life. There is no doubt it can be frustrating to look healthy when you are feeling like you have the flu times ten. And yet, if we were to really be honest, do we want to look as bad as we actually feel? There truly are some benefits to having a disease that isn’t immediately noticed by everyone you come into contact with. Lets take a second look at a few of those perks. You get to choose who to reveal your illness to and who not to. Some people you may immediately confide in; others you may wait and see if they feel “safe.” Some people you may never tell about your illness. You can avoid unwanted advice. When your illness is visible, even the person in line at the grocery store feels the burden to share the latest cure for your condition or tell you what you should be eating. With an invisible illness, no one knows and offers comments unless you choose to mention it. And then you chose to open up that whole can of worms. You can do you job without preconceived ideas about what you can and cannot do. At some point you decide who to reveal your disease to, but if you are doing your job successful, you may be able to keep it personal for years. You aren’t on the receiving end of pity or sympathy stares. People who use assistive devices like a cane or wheelchair, or who have a visible illness, must learn to not care what other people (both friends and strangers) may think when they see them shaking, or struggling to walk. You can fake it! If you want to just forget your illness and go out for a night with friends, no one has to know how much medication you took just to be able to go out. You don’t have to explain why you aren’t dancing. It can seem like your life is constantly controlled by your illness, but ultimately, you still can choose to put on some fun clothes pretend to be healthy and carefree for a few hours. Living with an invisible illness, or what some call a hidden or invisible disability, can have plenty of negative aspects and this article does not attempt to belittle them. However, to truly live life to the fullest, we must count our blessings. Some days the simple miracle of being able to look healthy despite feeling terrible is worth acknowledging and accepting it for what it is. 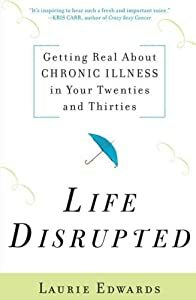 I have read many books on how to cope or live successfully with a chronic illness, and I am eager to read the ones that specifically address the emotions behind an illness, not just the illness facts. Not only did I discover a gifted writer who discussed everything from humanizing hospitals to difficult diagnoses, but also one understood the emotional roller coaster that I’ve personally been on since being diagnosed with an invisible illness. I was diagnosed with rheumatoid arthritis at the age of twenty-four, and ironically, I Laurie’s book was published the year that I turned forty. I wish I’d had this book years ago, but the impact the content had on me was not diminished in any way because of my age. I believe I related to the book even more, since I have already experienced so much of what Edwards writes about. I’ve had an illness through college, dating, marriage and parenting. Through the past sixteen years I’ve trudged my way through all of these without a manual. Although I wouldn’t call Edward’s book a “how to” book, the validation that it provides through her own illness experiences, as well as her professional journalistic look at the sociology behind illness is exceptional. It provides helpful professional information, with the hint of her diary between the lines. And I found a friend in one who copes with her illness best by burying herself in work. She writes, “As a college student I studied for finals and wrote newspaper articles from the ICU. In graduate school, I taught writing classes so fresh from being discharged that I still had a hospital bracelet on my arm. And all of this seemed perfectly reasonable to me. Why shouldn’t it?” (p. 142). Edwards, a journalist by trade, (read her blog, “A Chronic Dose” here) is not afraid to put aside her professionalism and “get real” by talking about things that gals with illness can be concerned about, such as not being able to wear “cute shoes” or trying to find the energy to have a conversation with college friends. She even discusses gazing out a hospital window longingly looking at her dorm rooms. These things are a big deal when you are young. Emotionally we learn to live with illness. . . but it’s just so daily! Edwards reminds us that those daily events of living with illness that can seem so significant are significant and not minor decisions. How do we explain our illness when we are dating? When do we reveal it? How do we survive the embarrassment of healthcare situations that are a little more intimate than we would like? For example, when the home healthcare professional shows up is a bit too good-looking and close to our age? How do we become independent adults who care for our illness when our parents still want to be consulted? Is accepting our limitations giving in to our illness? How much of a caregiver should we allow our spouse to be? Should we have a baby? Edwards has put together a wonderful book that will not only encourage and validate your emotions, but also inspire you to make positive changes in your own life. Her stories are never depressing (not an easy task for the best of writers) and self-pity is not in her vocabulary. Instead, her ability to laugh at her own circumstances, and share what she has learned on this journey so far, will encourage you, as her enthusiasm and joy for life rings through on ever page. This is a book I will heartily recommend for years to come to people of all ages. This review can be reprinted just cut out this sentence and leave this footer at the end. Thanks! Lisa Copen is the founder of National Invisible Chronic Illness Awareness Week and author of “Beyond Casseroles: 505 Ways to Encourage a Chronically Ill Friend.” Her passion is serving people through her Christian ministry for those with chronic illness, Rest Ministries, Inc.
Have you ever told your doctor about some odd side effects you thought you were having however, and were dismissed as “that can’t be because of the medication”? Doctors read the long lists of side effects. If the drug is available it means it has been approved by the FDA and therefore, the side effects listed often may only be for 1 or 2% of the population. But what about all the medications that are taken for years and then quickly grabbed off the market, recalled… banned? Here is a cool web site Ask a Patient. It looks simple (no fancy graphics here) but don’t let it its look fool you. Find lots of the best medicine links around! A Research Letter in the Archives of Internal Medicine (June 22, 2009) gives the results of a patient survey conducted on the patient site askapatient.com. Over the course of three months, 367 people responded; more than 50 percent reported muscle and joint pain with fatigue associated with bisphosphonate osteoporosis drugs. . .
That is interesting enough, but the real point of the story lies in the contrast with data collected on a Web site frequented by physicians, sermo.com. One doctor posted a case of joint, bone and muscle pain in an influenza-like syndrome associated with a bisphosphonate. When other site visitors were asked about this reaction, more than half said other clinicians had never seen it. I looked up a couple of the medications I am on. Seventeen people had rated Feldene, an “old” anti-inflammatory I’ve been on for about 16 years. I searched “prednisone” and 272 had written about it. Just a personal note: remember, when choosing a medication, you have to decide what is best for you personally at this time in your life. No one else can make that decision and just as you can’t stress out about all of the side effects written on the drug inserts, don’t let patient feedback scare you away from a medication you may truly need. 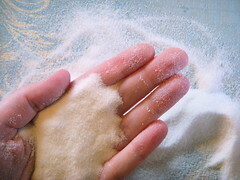 When I was first diagnosed with rheumatoid arthritis at the age of 24 (16 years ago), I was reluctant to take all of the recommended drugs because it said ulcers and such were common. 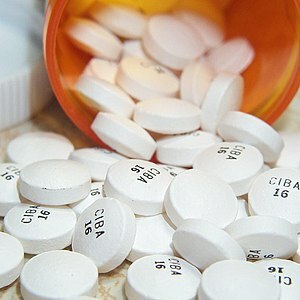 I took the medications and have never regretted it. Rather than having them put me into remission and be able to wean off of them, I had to keep adding to them to keep functioning. But I’ve never had an ulcer. I’ve been blessed to be able to handle medications pretty well without reactions or allergies. That doctor and I had our disagreements and I eventually found a rheumatologist I work with better, but I will forever be grateful he helped me get past the fear of choosing to take medication despite side effect.